(CNN) -- Australian banking giant Westpac Group announced Wednesday that its half-year cash earnings fell 6 percent during the period ending March 31, with net profit after tax down 1 percent to $2.17 billion (US $1.61 billion). 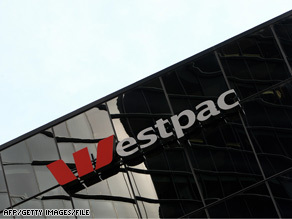 Westpac Bank signage is displayed in Sydney on May 13, 2008. Westpac's business unit Westpac Institutional Bank -- which serves corporate, institutional and government customers -- reported a 62 percent decrease in cash earnings, "reflecting the impact of the financial crisis on three large corporate exposures and the margin lending portfolio," according to the company. The corporation performed soundly in a very challenging operating environment, said Gail Kelly, Westpac CEO, in a statement on the company's Web site. The company strengthened its balance sheet "through capital raisings, lengthening our funding profile, strong growth in customer deposits, a reduction in our dividend and maintaining a stronger than usual liquidity position," according to Kelly. The company will cut its dividend to 56 cents, down 20 percent from the prior period. In its outlook, the company said much of its performance depends on the "size and duration" of the recession on the economies of Australia and New Zealand. "We expect impairment charges to remain at a high level throughout the second half of 2009 and into 2010," Kelly said, pointing to consumer stress caused by rising unemployment.